The Samoa Observer is the primary daily Samoan newspaper. Established some 40 years ago and run by a Samoan businessman (Savea Sano Malifa1) it claims a long track-record in taking on the Government of the day and standing up for the little guy. This claim is true to some extent and it can be rightly viewed as a mix between a newspaper, a tabloid and a Fourth Estate watchdog in many respects. Their tendency to rush to press with one-sided stories and shallow investigative work is balanced with long-term tenacity on some important matters of exposing corruption. In the last decade or so, as the owner has aged, and personalities have clashed between him and the current Prime Minister, quality of thought has mainly come from other editors who can have some good points at times but are rarely able to drill down into the real root cause of Samoa’s ills. While a challenge to speak words of wisdom daily as an editor of a newspaper, their response to corruption tends towards bleating and tut-tutting. The owner of Samoa Observer is widely viewed as a crook2 as multiple people I have spoken to have recounted not getting a fair deal or simply not getting paid from him. I’ve detailed his foolishness in previous commentary and blogging but he’s a proud businessman driven by money, making it and protecting it. His number one concern is clearly to make money and to not get sued in the process. His staff fear him and submit, for obvious reasons. The paper does take up the stories of the small guy hard done-by on occasion but these stories are quite often shallow, one-sided and are countered in due course by official denials and cover-ups. The Samoan government led by Prime Minister Tuila’epa appear to tolerate the paper and their stories but certainly do not respect them. I’ve noticed some good strikes from the paper in the five years that I have been here but the many more losses than successes indicate a gross inefficiency in terms of dealing with Corruption in Samoa meaningfully. They are a voice, but little more than that. I would counsel people on the end of Corruption to seek Samoa Observer’s support in leveraging their exposure but wouldn’t hold my breath on any meaningful change. I came to Samoa from New Zealand in September 2009 and immigrated in February 2010. I’ve blogged extensively about the Samoan culture, particularly in the context of the Christian world-view. This is my interest and I guess you could say it is a passion of mine. My third book, A little Slice of Paradise is currently pending publication and talks a lot about the Samoan culture alongside the factual events of my first few years in Paradise. I approached Savea on the 5th October 2012 (more than three years after I first came to Samoa), introduced myself, chatted a while with him in his office and told him that I would be interested in writing a column “Palagi Perspectives”, and shared a little of the planned subjects. We agreed to a deal – I would write 300-600 words weekly (as long as it “made people think and didn’t get him sued”) and he’d run one daily classified advertisement for me, which was a roughly agreed equivalent value. I summarised this conversation and our agreement by email to Savea that same afternoon. He instructed his staff accordingly. I blogged about the new challenge at the time4. I delivered, on time as promised and Samoa Observer published the columns for several months. Samoa Observer though didn’t deliver the advertisements as agreed. 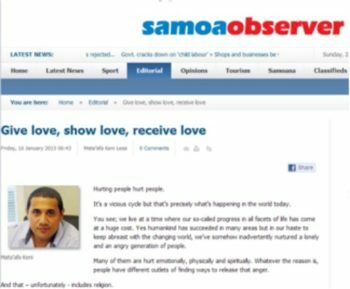 Despite several calls over those months, and follow-up visits, Samoa Observer dropped the ball badly. They didn’t or wouldn’t reconcile my account, although the Editor did recognise that they “should honour any deal they agreed to”. Savea got news from his Editor that I had suggested that to rectify historical matters, he should just pay me for the missing adverts and start the adverts running properly, then he fired me off an email that contained a little bit of flowery language, basically telling me to F*** off! Corruption, greed, foolishness and arrogance from the Fourth Estate! You can read the entire sorry details of this saga online, if you’re interested, with the actual communications and my commentary. 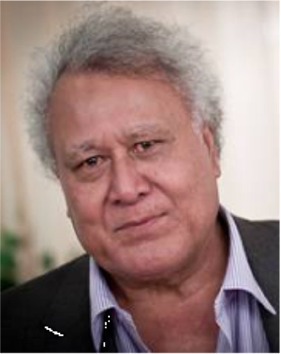 It’s quite sad to see the ugly pride of an old Samoan man, one who could be resting on his laurels with a lifetime of service to his country and the industry he worked in for decades, yet just shown up for being another greedy racist Samoan lacking in integrity the same as many others. But that’s corruption in Samoa outworked yet again, for you! As a former sub-editor at the Samoa Observer, my comments may be biased. But equating corruption in the Fourth Estate with the one newspaper that has done the most to challenge said corruption also seems biased. To centre most of that allegation around one, solitary instance of an unpaid debt lacks perspective, and risks appearing petty. This chapter leaves unexamined the very many corrupt actions taken by government against the Samoa Observer, and, more widely, against other news media outlets, including the state broadcaster. I am not suggesting Savea Sano Malifa is an angel without blemish. No one publishes for 35 years without making mistakes, even serious ones. But the challenges faced by Savea and all the other journalists in Samoa deserve retelling, so it is a pity you have chosen to focus on just your own experiences. The story of the Fourth Estate there remains to be told. Thank you for bothering to respond here Jason. > As a former sub-editor at the Samoa Observer, my comments may be biased. Perhaps, but I doubt it. You have insight, experience and bring balance to your professional work and this post. > But equating corruption in the Fourth Estate with the one newspaper that has done the most to challenge said corruption also seems biased. Yes it could be but the conclusions are highly valid nonetheless. In CIS I take one example and extrapolate it. Having lived in Samoa for seven years, worked with and around all the people you know, some of them both at work and personally I can tell you things that will REALLY surprise you. > To centre most of that allegation around one, solitary instance of an unpaid debt lacks perspective, and risks appearing petty. Yes it certainly could appear that way. There are two factors that perhaps you should also be aware of: a) the book was written Q1,2015 and supplied to the PM personally and only him. Much of the litigation and many other supporting experiences occurred around this time and later, and b) I did not include EVERYTHING, simply taking limited experiences. I have read and re-read this book more than any of the 22x I have written due to the potential for false accusation and defamation. I stand by my core conclusions 100%. > This chapter leaves unexamined the very many corrupt actions taken by government against the Samoa Observer, and, more widely, against other news media outlets, including the state broadcaster. Yes, this is a valid point. I am happy to publish anything you wish to add or say in any format/medium you so wish. The book though was an honest sharing of my experiences at the time. I left off MANY examples of corruption – the Customs Department, Health, Education, Conservation, you name it! I focused on the principle examples. > I am not suggesting Savea Sano Malifa is an angel without blemish. No one publishes for 35 years without making mistakes, even serious ones. You make two errors of logic here Jason – first this is idea of a “mistake” misconstrues my core message – we are not talking of “mistakes”, secondly tenure in business has nothing to do with the flawed character of the principal. I have met Samoa Observer in court proceedings more than once. I have read every judgment in Samoa and taken serious note of what the judges say about Sano and his ultra low level of credibility. I have engaged with many people over the years, most who fear him and do not want their name mentioned. I would say this though, 35 years in business shows his pigheadedness and stickability but it also has given us much material in which to assess his true character. As I think I have posted before, he makes up for his lack in the ethics department with energy in the self-promotion one. > But the challenges faced by Savea and all the other journalists in Samoa deserve retelling, so it is a pity you have chosen to focus on just your own experiences. The story of the Fourth Estate there remains to be told. I concur. Definitely. Watch this space. There is another factor that should be taken into account in reading and digesting CIS, and that is the primary reason for writing the book and then eventually publishing, some two years later was personal and political. For two years there was only one man who had read it. My expulsion from Samoa and how it was done eventually flushed him out as the coward, crook and unrepentant adulterer that he is. http://www.palemia.com. While your comments are valued and I think have a degree of validity, the ills within the Fourth Estate pale into insignificance when you know from where the corruption there comes.